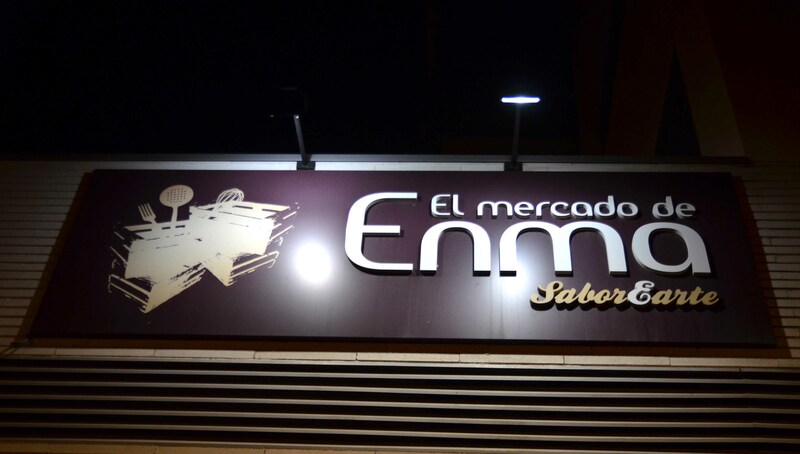 The El mercado de Enma is located in the pueblo (town) of Mairena de Aljarafe, a suburb of Seville. Boy, am l glad we discovered this restaurant. It is a great find. The food is delightful. The atmosphere is relaxed and the staff is awesome. We were about to make some chicken wings for dinner, but l just wasn’t feeling it. We decided on tapas, but wanted someplace different from the usual haunts we have in our pueblo, so of course l took to the internet :-) . Oh..where would we be without it? 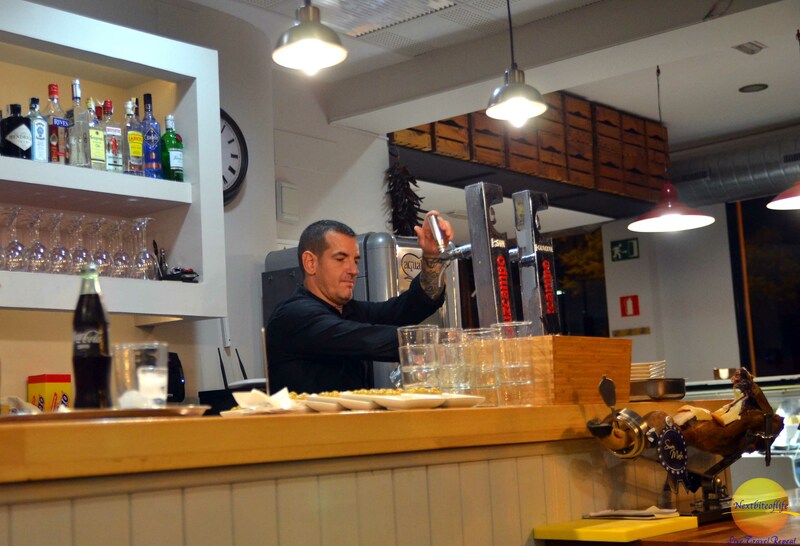 A quick search of restaurants and El mercado de Enma popped up, we decided to give it a try. The El mercado de Enma is only about four miles away from us, and looking at google earth, the buildings looked familiar, but we still couldn’t figure out where it was. We pass the main road all the time when we go to the city center, but the landscape is mostly apartment buildings and open fields. What we didn’t realize was that this was the street version of a mullet hairstyle – Business up front, and party in the back!!! :-) . Just behind the main road is a lovely street filled with loads of tapas places. Who knew? 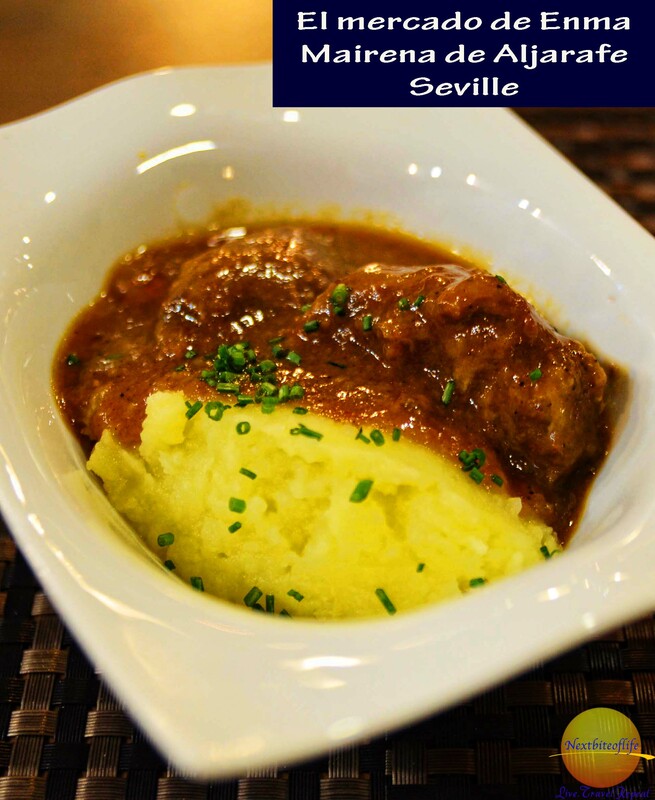 We have been living in Seville for almost six months now, and we never knew. We thought the commercial area further on down was the only place for food. Duh! He had the biggest smile, and the coolest head as he got a lot of orders for drinks. 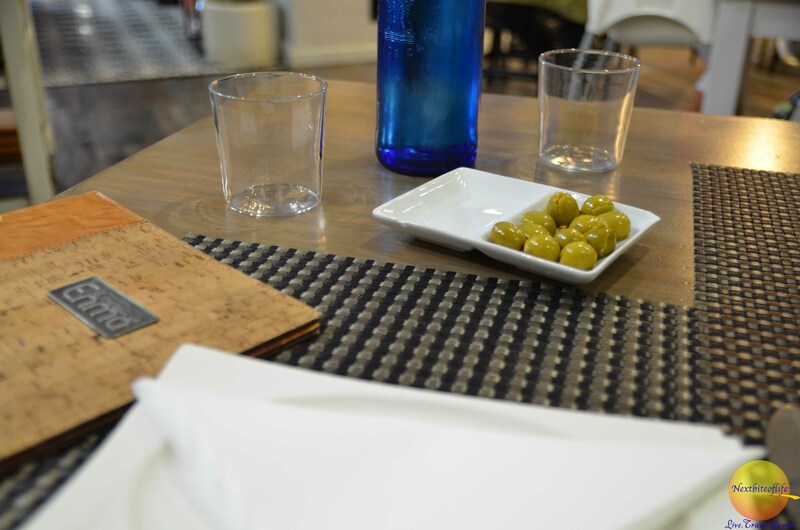 pitted olives, a “must” offer starter in Andalusia..
– The space is contemporary, with stainless steel cooking appliances. It has an open kitchen, so you can see whats going on. The waiters and waitresses are in black uniform, and they take the orders with a hand-held device. This cuts down on a lot of errors as the order is transmitted to the kitchen directly. – They have a lot of staff that work as a unit. Most restaurants here will have one or 2 waiters at the most who handle all the tables. That is partly why l think the meals can last hours. It’s not just waiting for the food, it’s also waiting for someone to take your order :-) . This adds way more time when you’re trying to catch the waiter’s eye. Here, someone takes the order, and when the food is ready, another waiter/waitress will deliver it to the table if your waiter is busy elsewhere. etc. This is quite efficient. You can “turn over” the tables quicker. Boom! Increased revenue. 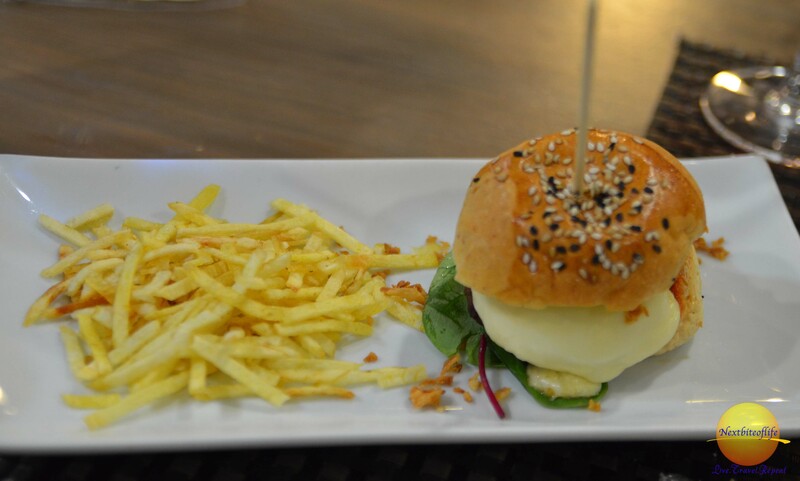 – They also have some of the food available for takeaway. Also, very forward thinking! They say you can always tell how good a place is by the number of locals eating there. Of all the restaurants on the street, this was the most packed! Imagine how nice it is to get the food to take with you if there are no seats and you really, really want the food. Takeaway is something that isn’t very common around here. It’s nice to see. Now, for the food!!! Everything was fantastic! 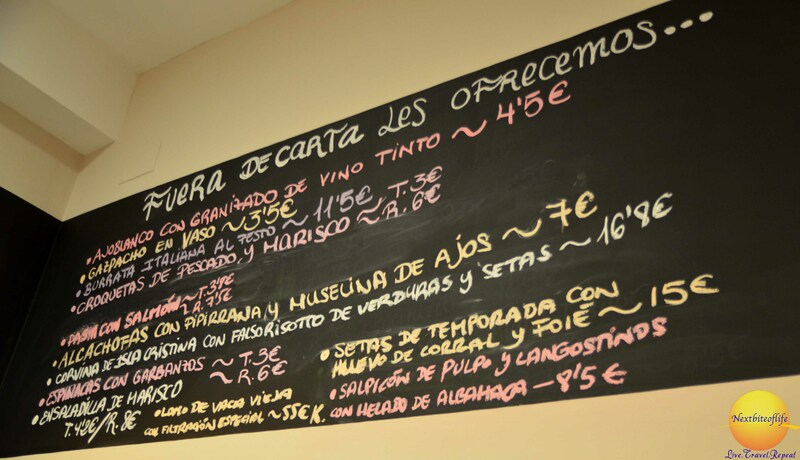 We had a total of five tapas, 2 desserts, a liter of water and an excellent glass of Malaga produced wine. The bill was €30. It is a very fair price indeed in my opinion. I should have paid more attention to the board that has the daily specials as l would have also ordered the spinach with garbanzo beans, which l have come to love. Hands down, the best tuna salad l have ever had. I’ve made it often, and just once did l get it to come out perfect like this, many, many years ago :-) . 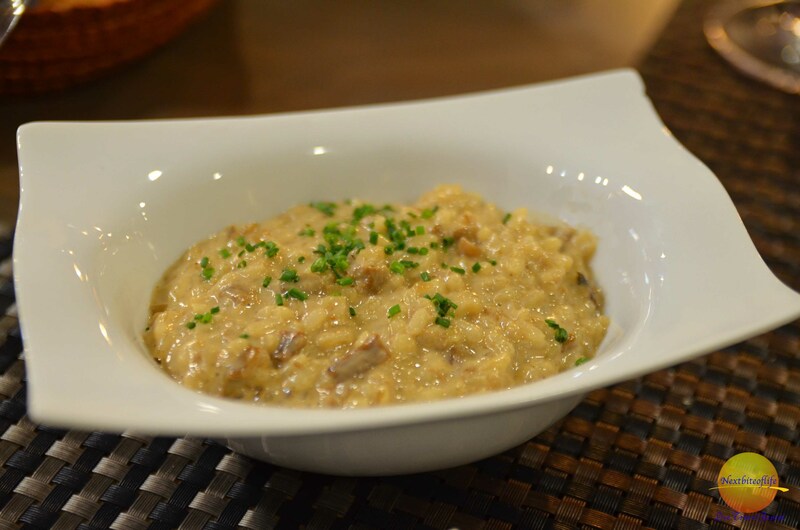 The mushroom risotto. It was simply perfect. We had a hard time deciding which tapas was the favorite. It came down to this..
..and this. This dish is called Carrillada. 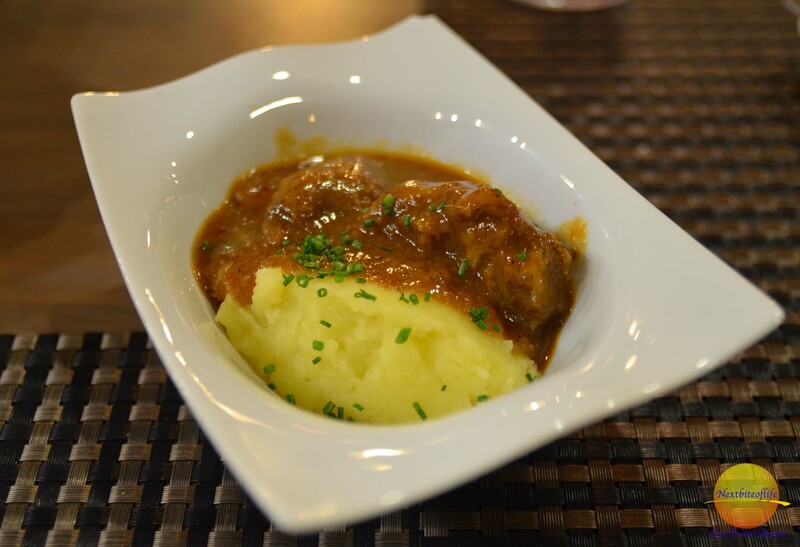 It is stewed meat of beef (cow cheeks if memory serves me right). It was served with mashed potatoes, and a curry gravy was just insanely good. It melted in your mouth. Bliss! 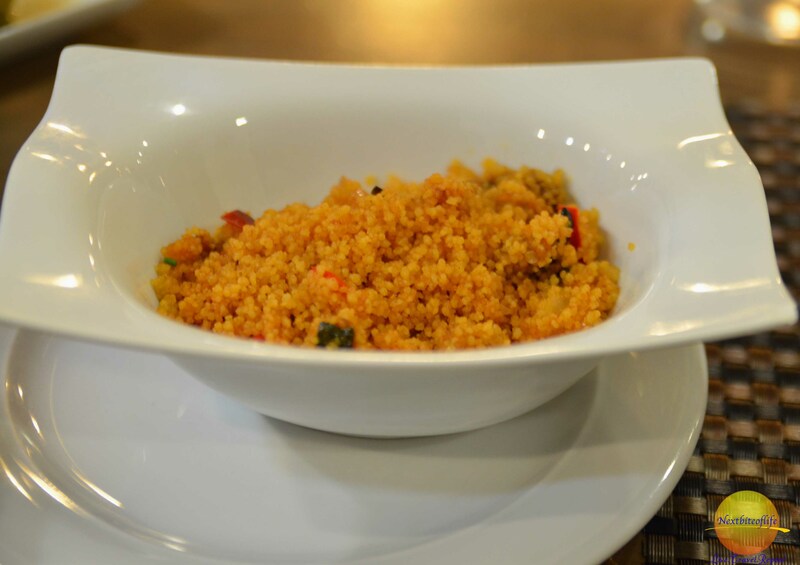 The vegetable couscous was just right. Not too dry or mushy. It was the perfect blend of grain, eggplant, red peppers, onion and raisins. I did not have any of the cheeseburger which was served with some delicious crispy fries. Federico had that all to himself. He said it was good. I didn’t want to eat it because as l have mentioned before in a previous post, l just can’t get excited about the hamburgers here. The meat just tastes a bit different to me. He liked it a lot, but he said he would have preferred another helping of the risotto or the meat. They were awesome!!! 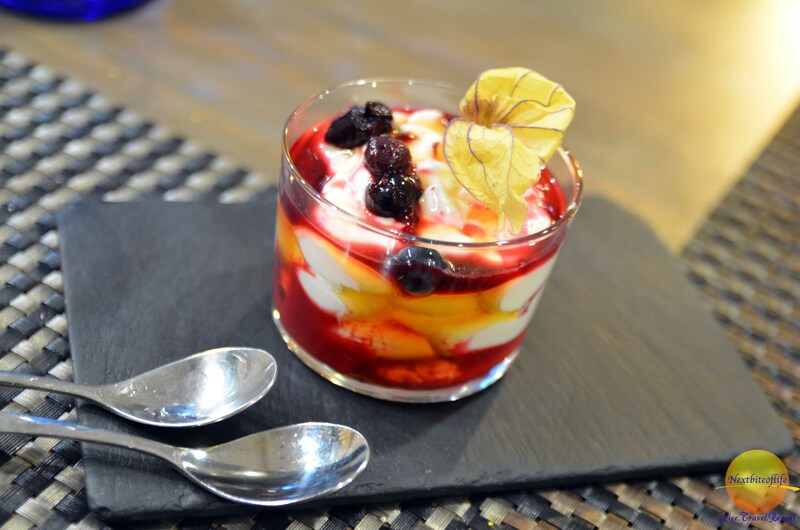 For dessert, he had a yogurt with fruit parfait. It was so delicate. The yogurt was extremely fresh and the cherries were tasty. There were swirls of honey to add some natural sweetness. I tasted it, and it was great. What was even greater was my dessert :-) . It was small but amazing. It was called a bombona con chocolato (chocolate bomb) . You could choose to have it with vanilla creme instead. 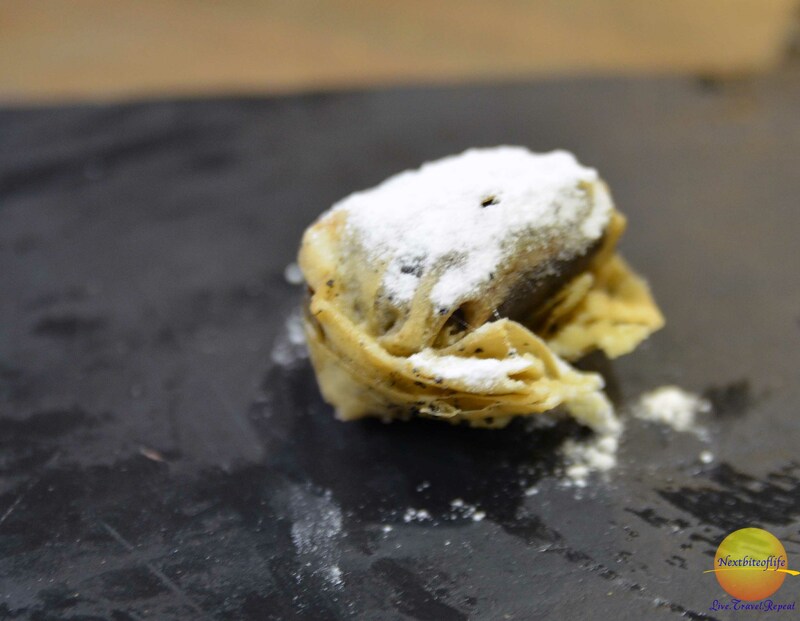 The outside was crunchy, almost like a Chinese wonton and the inside tasted like a souffle and was dusted with confectioners sugar. It was only a bite, but what a blast feeling the warm chocolate with the crunch. It was just WOW! Like a bomb, as the name says :-) . On the whole, l highly recommend this restaurant. It has great food, great staff and good prices. If you are in Seville visiting and don’t have transportation, it might not be feasible as the closest metro stop is about a mile away. It would not be convenient. If you have a car however, yep! I think it’s worth the 10-15 minute drive from the center. The only negative thing l have to say about the El mercato de Enma is that there were a quite a few families with really young kids, at least on the evening we were there. It’s not neccessarily a bad thing, but the parents did not discipline most of them. I don’t blame the kids, they are just being themselves. I do however blame the parents. There was a lot of screaming, yelling, and crying. At one point, there were like 2 kids about four years old on their knees crawling around the restaurant playing, the waiters had to maneuver around them. My wicked side was like, it would only take one swift kick and an “oh sorry.. l didn’t see you there” to put an end to that nonsense. :-) . So, the couples like us and several others were screwed :-) . It is certainly not the fault of the restaurant, but next time, we will try a different time. Since this place is usually busy, you definitely want to make a reservation. I was telling Federico that we should just turn up early. I’m glad he didn’t listen, we would have had to wait, which would have made me cranky as it was already past 9pm. You guys are always eating the best looking food! I totally agree with you :-) . This afternoon, the groceries involved getting mushrooms for a risotto. He already makes an awesome red one. He is going to try the mushroom one. He is also going to try and replicate the curry carrabilla .. I can’t wait. YUUUMMM!! I always love your food posts. I’ll be in Seville next year in March and will definitely keep this place in mind. Thanks for sharing! I think you would really enjoy the food! Fantastic :-) . I am also curious to see Federico’s version since he is such a good cook. Glad you are going to make it down here on your next trip :-) . Yum! That looks delicious. Again, I made the mistake to read an article of yours when I was hungry and now I want everything you had. :) Plus a Gazpacho – I am a big fan of that and I didn’t ever get the chance to eat one made in Spain, which I believe is even better than the stuff we have here. Haha! It’s part of my cunning plan ;-) ! 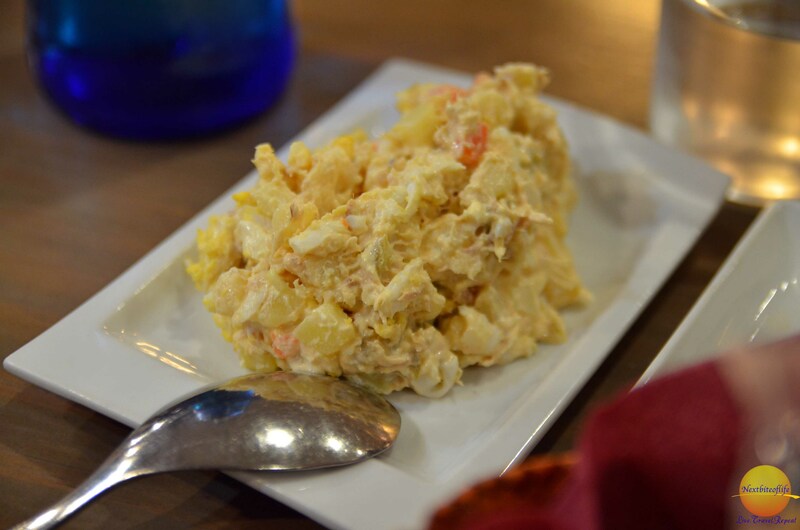 Make everyone hunger for Spanish food. Glad it’s working!!! You would love all the food. I have to admit that l have never tried Gazpacho. Everyone says l have to have it, l have seen it served and it looks colorful, but l don’t think l would like it. Maybe next time l go with a friend who is Spanish, l might order one, then if l don’t like it, she can have it because l would hate to waste it :-) . If you say it’s good, l just might be brave enough next time..
Don’t mind me. I am just catching up on your posts. I probably shouldn’t have read this on an empty stomach. The first photo with the fries had me hooked, I love fries especially skinny ones and the ones in the picture are perfect, they also look like they have just the right amount of crispiness. Ha ha! The fries were perfect. I told him l didn’t want any, then l took one, and ended up eating most of it :-) . It was great, as was the rest of the food! So glad we found it..yeah! Great photos of food. Can’t stand today’s laissez faire parents who don’t respect other people’s space by not reprimanding their kids. Dogs usually better behaved than kids. If I had done that as a kid I’d have been slapped across the face and had a belt taken to me when I got home. Thank you :-) . Federico and l were saying the same thing. My mother would never say a word, but we wouldn’t have misbehaved, but whatever devil may have possessed you to do it, she would beat it out of you that very second, in front of all :-). His mother would wait till they got home. Yep, our dogs would have behaved better..haha.. Oh well, the joys of going out. “The street version of a mullet hairstyle” – ha! That’s a unique way to describe the area. I rather like going to restaurants in Europe and other parts of the world like Turkey where the service isn’t rushed. It’s refreshing when restaurants aren’t overly concerned with turnover at the cost of guests’ discomfort. But everything looks yummy – especially the risotto and couscous. Mmmm…. I like taking my time over a meal too, but they take it too far. Three hours, which can happen often is just a bit too long sometimes, but we are getting better :-). I will let you know how Federico’s mushroom risotto comes out tomorrow. It was yummy. Truthfully, a mullet was the only thing l could think of.. :-) . Delicious looking food and your way of describing is so evocative. You should try food writing in all seriousness! I’m torn about blaming the parents- on one hand yes, they are responsible for making sure their kids behave properly, on the other hand from what I have observed there seems to be no managing of certain kids. My sympathies would go to the red faced, rather annoyed/embarrassed/apologetic parent who clearly isn’t okay with poor behaviour. But those who are smiling and unconcerned about how their kids are upsetting others get the side eye from me. This is why I don’t hold it against restaurants or hotels who operate a no kids policy. Awwwhh..thanks for the compliment :-) . I too get upset at the parents that think everyone has to suffer because they couldn’t pay a babysitter to watch the kids, and do nothing to rein in the kids. It happened to us once in Jamaica. Our last day, we wanted it to be so special and went to an expensive restaurant. The table next to us had the worst kids who kept yelling and running around and it was a romantic place. We gave the stink eye and asked to be moved far from them, (well Federico did) which gave everyone else the confidence to complain and the manager had a talk with the parents. It shouldn’t have to come to that! We always smile to kids that behave, but you can’t blame the kids and l certainly like you say can not blame the restaurant.